We have updated the site's CSS to a newly refactored LESS system, so that it's easier for us to fix SE network CSS bugs globally and launch new features in the future. We've updated most of the graphics to SVG for retina support. We have fixed a LOT of obscure bugs that arose when new features were not thoroughly tested across the entire network. We've launched the new user profile. 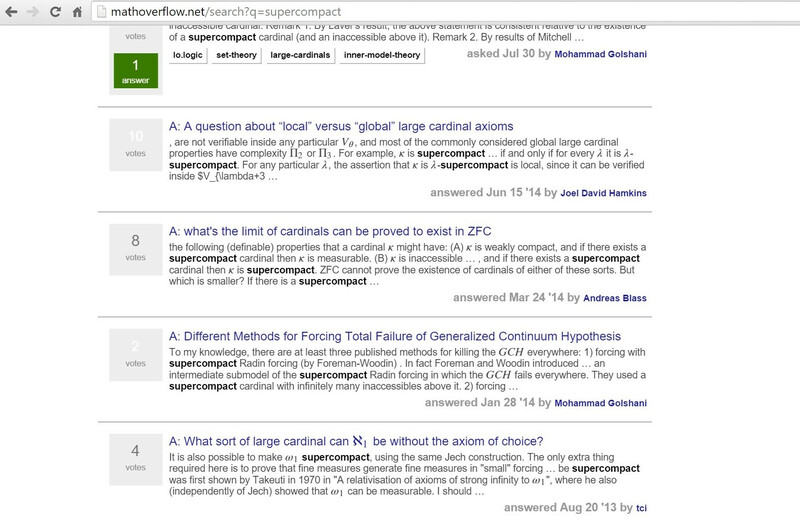 On the search results page, many questions appear to have white-on-grey rep counts, which is very difficult to read. I'm not sure what information this is meant to convey, but it is basically illegible and should probably be changed. On the main site the following are too large. "Add a comment" and "Start a bounty" are the same size, and should also be a bit smaller. The horizontal line at the bottom is also a bit weird. As far as I can tell in the list of questions, questions with accepted answers do not look any different from question with just answers anymore. Before the change the former where dark green and the latter light green. Now both seem light green (and unanswered ones were and are red). Please restore some visual distinction between question with accepted answer and just answers. Ps. Comparing the old and the new logo, I also notice that the kerning between the "f" and the "l" is slightly looser in the new version. It's not too bad, but the extra blank space does somewhat break the flow (pun not intended, really!) of the text out of the box. Could the gap in the "fl" perhaps be tightened a little bit — maybe not quite as tight as in the old logo, but a pixel or two closer? It is not clear from the text of the "question" above what differences from the old layout qualify as bugs which should be reported, since "feel" is a very subjective thing. In any case, I noticed that the font sizes of certain elements seem to be smaller than they were previously. In particular the size of the tags under questions as well as perhaps the related questions linked in the sidebar are now nearing illegibility for me. I would prefer if they could be made larger again. Free form flag has the same problem as Math.SE, and maybe other sites as well (I don't have accounts so I can't check). The textbox overflows to the right of the form. I posted the same problem on the parallel meta.Math.SE thread, including a screenshot and suggestions for how to fix it. The screenshots are from Firefox 14.0.1 on Linux, but as I checked on another machine, it’s also broken in FF 26. In the "related" questions list on the side, the number of votes for questions with accepted answers is "white on gray" and for me almost impossible to see. (For those without it is "black on gray" and nice). Tag Wiki is shown inside a bordered box. The border is way too thick. The label of the next privilege (the same is true for "next badge" (not shown here) by extension) is not vertically centered. Changing the padding from 4px to 2px solves this problem. Similarly the silver bullet (word play!) next to the "top tag" is misaligned as well. There canceling the padding, or the position attribute solves the problem entirely. I'm not sure which one is preferable, though. It has been said by Asaf Karagila that "The horizontal line at the bottom is also a bit weird". I think the line is fine as it allows at one glance to see where the comments start. BUT if there are more than 1 answers, those should also be separated by other horizontal lines, maybe thicker and/or longer to the left (like the line unter the title). 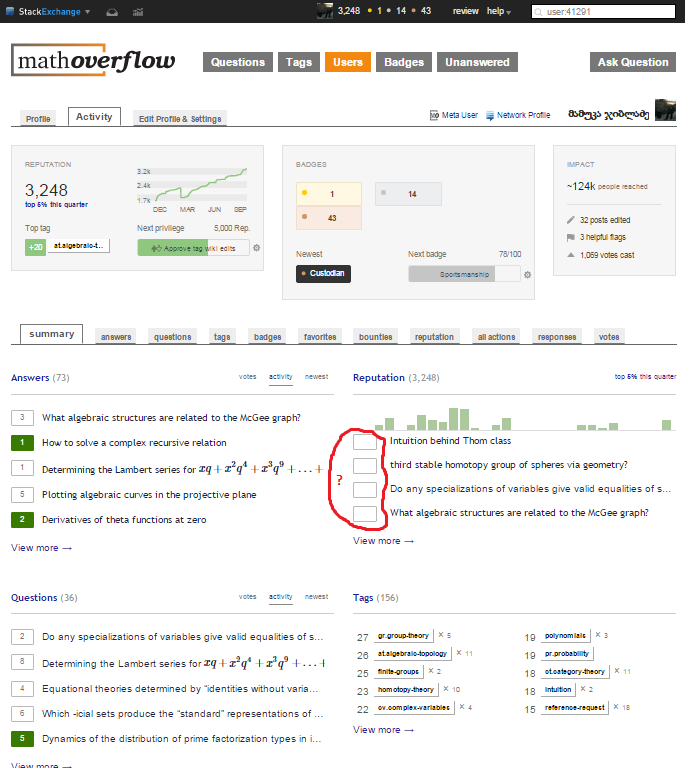 Math Educators Stackexchange is live! Help! Help! The colors are off!